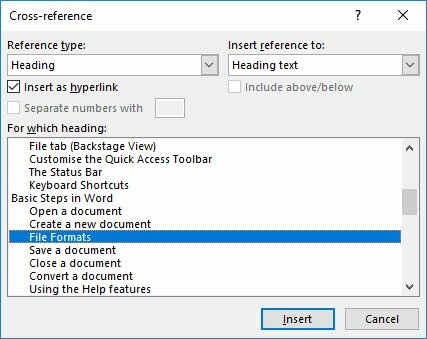 When working with long documents in Word, you may find yourself searching for an easy way to link content between different pages. 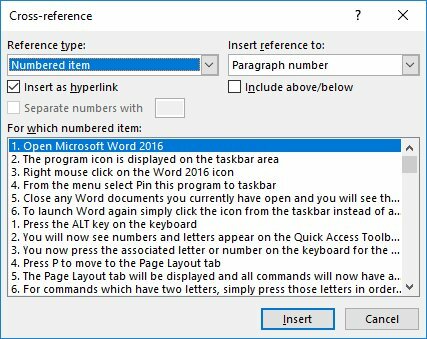 I’ve seen many imaginative ways of performing this function using Microsoft Word but today I want to show you the easiest way. You can see at the end of the paragraph the text (See File Formats on Page 15). The text “File Formats” and the page number are both links which when clicked will move you to either the particular heading or page number within the document. A cross-reference is essentially an internal hyperlink within a Word document which places text within a paragraph and links to content in another paragraph or page. I hope you have found this post on cross-references in Word useful. Click here to see more articles on Microsoft Word. Like shortcut keys? Check out my favourite shortcuts for Microsoft Word.